May 12 09:10: Magnitude recalculated from 5.1 to 5.2.
newtown, Calcutta (619.4 km SSE from epicenter) [Map] / MMI V (Moderate shaking): i WAS IN THE SCHOOL WHEN EARTHQUAKE STRIKED. ALL BENCHES SHAKED AND WE ALL RUSHED OUTDOORS. 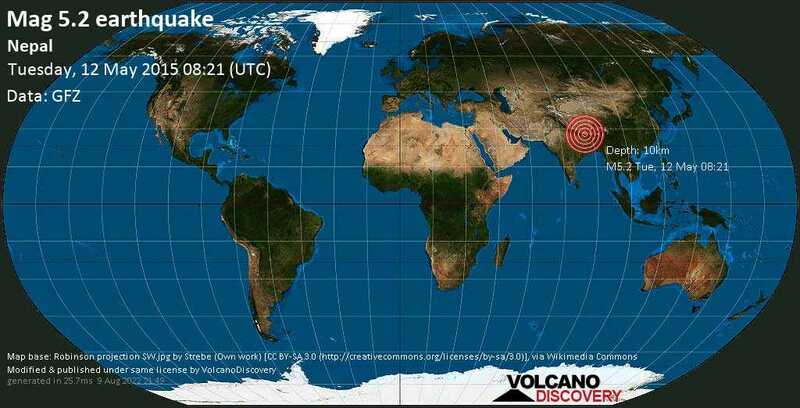 kolkata (623.8 km SSE from epicenter) [Map] / MMI V (Moderate shaking): felt for 30 secor so.